The prayer that follows should be recited for nine consecutive Tuesdays, lighting a candle on each Tuesday. 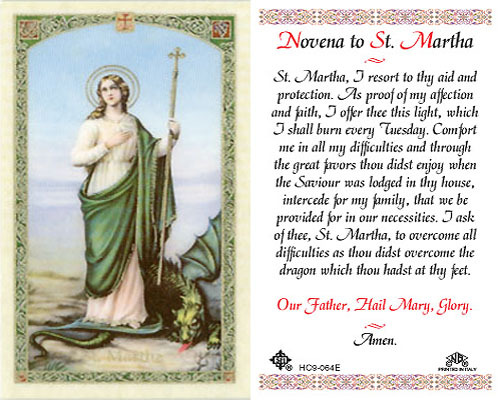 This miraculous Saint has been known to grant anything, no matter how difficult it is, before the ninth Tuesday. Saint Martha, I resort to thy aid and protection. As proof of my affection and faith, I offer thee this light, which I shall burn every Tuesday. O Sweet Jesus, Saint Martha lived in Bethany with her brother and sister, Saints Lazarus and Mary. She attended to Your physical needs while You rested and fellowshipped with good friends. I ask her to pray for my gift of hospitality. Teach me, dear Lord, how to truly welcome friends, family, and strangers. Increase in me the same respect for them as I would give to You if You appeared in the flesh. Help me to invite You into my home through the choices I make in television shows, conversations with others, and the type of jokes I tell or listen to. Give me a spirit of holy hospitality. Saint Martha, pray for me. Amen.